“This is epically important,” tweeted Wikipedia co-founder Jimmy Wales, about a new simplified editing platform aimed at massively expanding the number of people who contribute to the online encyclopedia. A deceivingly tiny percentage of users actually contribute to Wikipedia, despite the foundation’s earnest attempts at making it an inclusive, democratic creation of mankind (estimates put the active contributor base at around 0.7%, who make up 50% of the entries). From what we can see, the new simplified editor delivers on its promise: editing an entry feels very much like writing an email or Google document, with a few simple font buttons up top. You can check it out for yourself here. 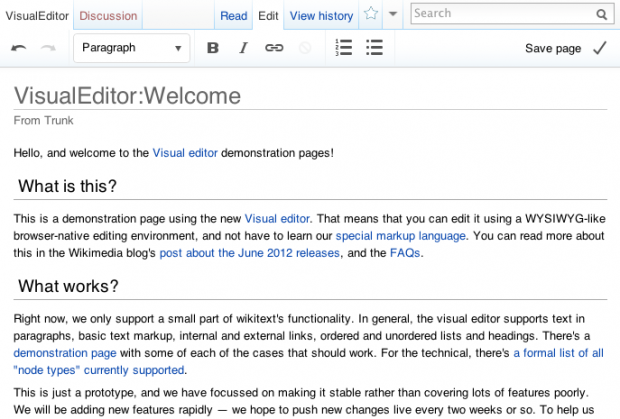 Have you ever wanted to contribute to Wikipedia, but were turned off by the text editor? Share your stories below about why you do, or do not, contribute.